We’ve learned some interesting things about providers publicizing cash or self-pay prices in our New Orleans partnership, “Cracking the Code.” Perhaps not surprisingly, when the people we’re talking with understand how this can benefit them, they give up the prices — information that for years has been a closely kept secret. Providers’ willingness to disclose prices has changed significantly since we started doing this in 2011. Then, it was much harder for us to find pricing information. We surmise that the providers are more willing to disclose these days because more people are asking for a cash price — maybe because they were uninsured at some point, or between insurances, or they have a high deductible, or a combination of those factors. It’s also true that when we first started doing this, we had to learn how to do it well. 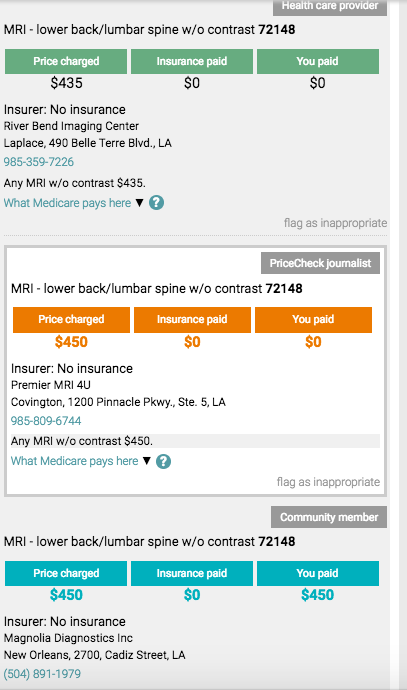 In our New Orleans partnership, we decided to go back to all the hospitals after our launch, and do a story about the ways they think about revealing prices. We asked questions like this: What’s your pricing policy? How do you think about it? If you don’t give prices over the phone, how’s a patient to know what something will cost? If you give prices over the phone only for patients, is there anything you can tell us that will help them? Oh, and here’s a spreadsheet with the prices we’re looking for, for around 20 procedures. Would you reconsider and fill it out and send it back to us? Perhaps not surprisingly, one big hospital chain that had declined to supply prices to our reporters in our early survey later chose to supply prices after this request. It’s the LCMC Health System — a group of five, including Touro Infirmary, Children’s Hospital, University Medical Center, New Orleans East Hospital and West Jefferson Medical Center. North Oaks Health System also sent in prices in response to our partners’ request. Several weeks after we launched, Slidell Memorial also chimed in with prices. Here is a report from one of our partners about how that transpired. For the text of the hospitals’ response about how they think about this, look below. Then journalists at our partners reached out directly to some other non-hospital providers and asked them to supply prices. We immediately heard from several self-standing radiology centers who wanted to be included. Diagnostic Imaging Services, Medical Center Diagnostics, River Bend Imaging and Houma Medical Imaging all sent prices. To see what that looks like, you can go to our interactive software on one of the New Orleans sites, say this one on Fox 8 Live, and search on a common MRI, say 72148 MRI of the lower back/lumbar spine without contrast. The prices we collected pre-launch are in orange; prices shared by our community members are in blue; prices sent in by providers are in green. We also heard back in response to our request from Metropolitan Gastroenterology Associates, a chain of ambulatory surgical centers with 21 doctors at three locations in the metro area. They sent in cash prices for a screening colonoscopy at all three locations. We noticed, though, that they offer other procedures, and we asked if we could have cash prices for them also. To read more about our New Orleans partnership, go to this page. broad estimates to be meaningful. resources dedicated to helping them do so. an uninsured patient should expect to pay for the most common conditions treated at the hospital. about their bills. We provide the same financial resources as all HCA facilities. Medicaid determine how much they reimburse hospitals, and insurance plans negotiate rates.